No Alibi 2010 is a 500-mile, two-day tour of Eastern Washington exploring the beautiful scenery, pleasant weather and endless roads of Eastern Washington. 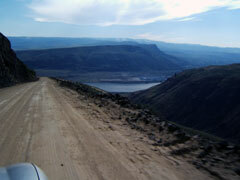 You'll see some of the best gravel back roads and some quiet paved ones as well. The event will begin and end in Moses Lake, Washington, and overnight there as well. 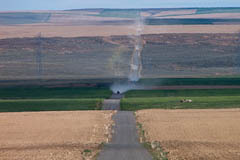 Moses Lake offers a central location to reach many of our favorite roads from the last ten years of No Alibi. 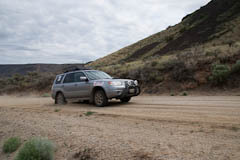 The course will use all types of roads from highways to wide gravel roads to twisty and dusty dirt roads, however No Alibi roads are selected for their character and are not of the car-breaking variety. No Alibi typically enjoys beautiful early-summer weather and presents a peek at the green and growing season. Our selection of roads and scenery are designed to please but following tradition Saturday night features a social gathering including a top-notch dinner. We'll also have a BBQ at the finish. Our event is intended to challenge the experienced competitor but is completely suitable for novice or lightly seasoned entrants. No Alibi 2010 is also round one of the 2010 Pacific Coast Challenge rally series. Don't let this photo discourage you! Michaels on the Lake continues to exceed our expectations for quality food and service in Moses Lake. Our dinner on Saturday was outstanding in preparation and service. Michaels also catered our BBQ in Blue Heron Park on Sunday with equal skill and attention to detail. We heartily thank Michaels for a job well done. Memories are Forever Auto Museum is a hidden gem in Moses Lake. We kindly thank Dell Wiberg for taking the time to open early for us and give us a peek at the wonderful collection of vehicles and artwork. We'd love to post your photos or a link to your photos. Contact the webmaster! 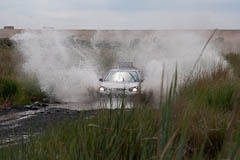 Congratulations to Marinus and Renee Damm, winners of No Alibi Rally 2010! Saturday Details, in PDF format. Sunday Details, in PDF format. Pacific Coast Challenge International Rally Series: No Alibi 2010 was round 1 of the PCC series this year. Your participation and finish position in No Alibi earns points in the series. We encourage you to contest all PCC events. Complete Information on the series is available at the Pacific Coast Challenge Website.